In the center spacious and bright three room apartment with large living room of 65 m2, and roof terrace of 56 m2. Maintained staircase, entrance apartment on the 1st floor: hall, living room with open kitchen and access to the roof terrace spiral staircase to the 2nd floor. 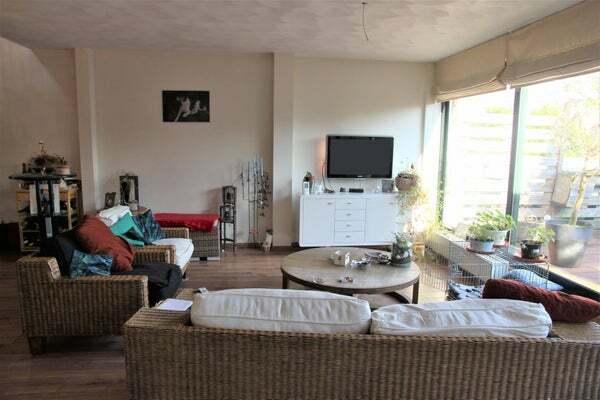 Spacious very bright living / dining room 65 m2, laminate flooring, and sliding doors to roof terrace. 1st bedroom at the back (approx 3.50 x 5.20) total 18 m2 and fitted wardrobes. 2nd Bedroom (approx 3.40 x 4.1) total 14m2 spacious bathroom 5m2 with shower, bath and sink.